Brisbane to Melbourne - the long way and via the Outback!! who have well established domestic and international programs of providing safe, decent and affordable shelter to underprivileged families in need. We raised $4,700 in sponsorship from family, friends and work colleagues and we raised another $2,300 by selling our Postie Bikes!! ... or the individual days below. We've been keen motorcyclists for more than 30 years and currently own two Honda GL1000 Goldwings, two Honda CX500s, a Honda SL175, a Honda NT700V Deauville and a BMW GS1150 Adventure. We are members of the Australian GoldWing Association, Vintage Japanese Motorcycle Club, BMW Motorcycle Club (ACT), ACT Veteran, Vintage and Classic Motorcycle Club and Ulysses. After many years of procrastinating about participating in the Postie Bike Challenge we decided that 2009 would be the year in which we finally did it!! 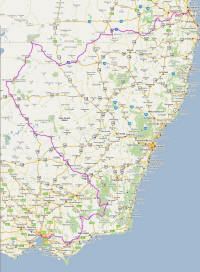 The direct ride from Brisbane to Melbourne is about 1,700kms. There is no point in taking the easy way when you can take the adventurous - 3,300km (including 1,000km of unsealed roads) - way at a top speed of 70 km/h! The inspiration for the 2009 route comes from an attempt by the organisers to combine and contrast the feeling of riding in the outback to that of riding through the New South Wales and Victorian high country where we should still catch glimpses of the snow capped mountains. So far 42 riders (8 of whom are women) ranging in age from 20-something to 70-something have decided to take on this year's challenge!! While most entrants are from Australia, the United Kingdom and New Zealand are also represented. We've also put together a chart to show the average minimum and maximum temperatures during the month of October along the route. Plus we've also received lots of sponsorship from our very generous family, friends, work colleagues and associates!! You'll be able to monitor our trip in real-time courtesy of our SPOT Satellite Messenger. For those of you who live along or near the route we'll be travelling you're most welcome to come along and cheer us on as we pass by or, if possible, stop and have a chat to us when we take a break (which it will always be time to do if we see someone we know!! ).